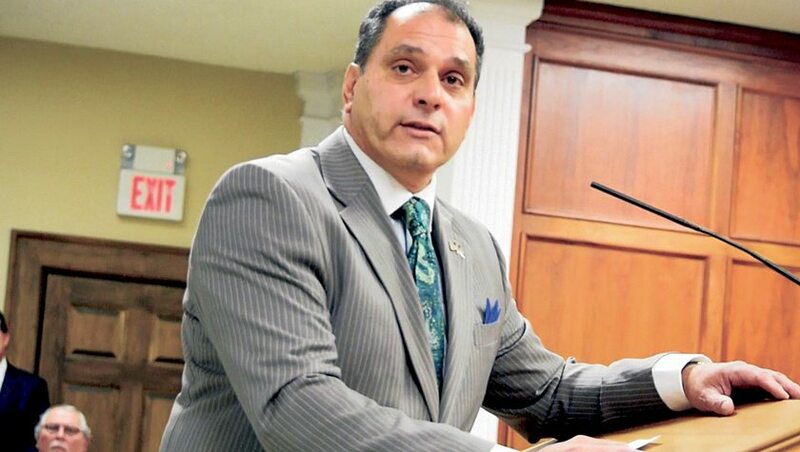 State Assemblyman Joseph Saladino “crashed” the Jan. 24 Town of Oyster Bay Town Board meeting to announce his run for supervisor of the township. His appearance was the latest chapter in a saga that began Jan. 4, when longtime chief executive John Venditto stepped down to prepare his defense against federal corruption charges. Saladino was all set to be sworn in to replace Venditto at an emergency meeting on Jan. 6, but there was a lack of quorum. At the Jan. 10 regular town board meeting, Councilman and Deputy Supervisor Joseph Muscarella announced that there would be no swearing-in and indicated that the board needed more time to decide. No other candidates have been publicly named. The lack of action seems to suggest division on the board over appointing Saladino, but no one in a position to know is commenting for the record. He and the rest of the board members filed into the boardroom reached by a door adjoining the dais. As town officials and other attendees milled around, Saladino—who had shown up late in the meeting to sign the speakers’ card on the table next to the podium—entered the boardroom. Minutes later he came out, and shortly after, councilmembers returned and took their seats and Muscarello called on Saladino to speak. The Massapequa-based, 13-year member of the state assembly read out his statement: “I came here today with every expectation that the board would take a vote, make an appointment, and swear me in as supervisor of the Town of Oyster Bay. [But] it is evident that a vote will not take place today. The town requires a full-time supervisor to take charge of matters, to fix its problems and get the town back on track. The town cannot be led by a part-time supervisor. That’s been said by the members of the board publicly. “It is time to right the ship, to get away from any chance of a town by run by a headless horseman,” Saladino continued, then declared his intention to run for the chief executive office. Muscarella called out, “Widsom tells me not to comment. Thank you,” and the town council made its exit. In a press release, the town announced that it has added additional evening town board meetings for 2017 in response to public input. Meetings are generally held the first and third Tuesdays of the month. The released schedule lists 10 a.m. starting times at the first meeting and 7 p.m. at the second. The board next gathers Feb. 14, at 10 a.m., followed by Feb. 28, at 7 p.m.
Frank Rizzo is the editor of The Farmingdale Observer and Hicksville News, as well as a contributing writer for Long Island Weekly, specializing in sports features.